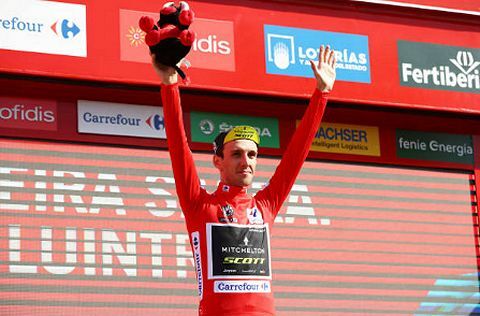 Alessandro De Marchi secured his third individual stage victory at the Vuelta a España after an impressive solo attack in the closing kilometers of stage 11. A battle to make the breakaway was brewing even before the start of stage 11 with riders and teams sensing the opportunity for the day’s successful attackers to go all the way to the line on the hilly 207.8-kilometer course that included one category two and three category three climbs. The intensity at the start of the day saw the peloton cover 49 kilometers in the first hour of racing and despite various strong moves trying to go clear, the breakaway was yet to form. 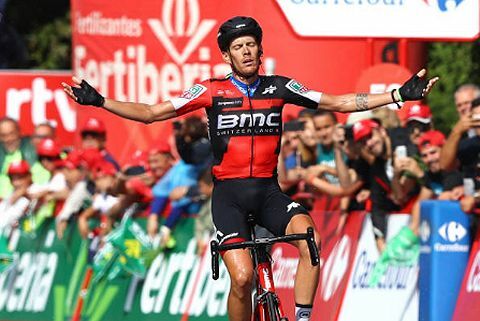 BMC Racing Team continued to be active at the front of the main bunch and this tactic paid off with De Marchi, Nicolas Roche and Dylan Teuns all making it into the 19-rider breakaway that eventually went clear approaching the 100-kilometer to go mark. 25 kilometers later, the group’s advantage had extended out to 4’30” but with Thibaut Pinot (Groupama-FDJ), who started the day 2’33” behind race leader, Simon Yates (Mitchelton-SCOTT) on the General Classification, making the selection, the main bunch reacted behind on the penultimate climb, the Alto do Trives. Teuns looked strong as he went on the attack alongside Pinot with 65 kilometers remaining however the rest of the group, which still included Roche and De Marchi, was chasing hard and as a result they came back together around 3’30” ahead of the peloton with 50 kilometers to go. On the day’s final categorized climb, the 8.8-kilometer long Alto del Mirador de Cabezoas, which had an average gradient of 4.3%, De Marchi went solo before being joined by Jhonatan Restrepo (Team Katusha Alpecin) just before the top of the KOM. The duo’s advantage over the first chasing group was still over 50 seconds inside the final five kilometers before De Marchi showed his grit and determination to launch an impressive solo attack which eventually saw him punch the air with delight as he secured the stage victory. Talk us through the moment you decided to attack inside the final five kilometers? “If I waited for the sprint then I think I would have been second. The only option was to try everything on the last climb. Honestly, I didn’t feel like I had the best legs but the win was mine.